Beautifully written and deeply poignant, The Making of Us allows readers to walk alongside author and radio personality Sheridan Voysey during a transformational moment in his life journey. Picking up where Resurrection Year: Turning Broken Dreams Into New Beginnings left off, Sheridan helps us process what we can learn about our identities in the face of disappointment and change. Life had not gone according to plan for Sheridan Voysey and his wife, Merryn. When infertility ended their dream of becoming parents, they uprooted their lives and relocated from Australia to Oxford, England, so Merryn could pursue her professional goals. But the move meant Sheridan had to give up his well-established career in Christian radio, and though he was experiencing some success as a writer, he couldn't reconcile his expectations for his life with the reality he was living. Lost and directionless, he came to a sobering realization: I don't know who I am. Following the example of many a seeker, Sheridan decided to pair his spiritual journey with a literal one: a hundred-mile pilgrimage along the northeast coast of England. Inspired by the life and influence of the monk Cuthbert, who was among the first to evangelize northern England in the 600s, Voysey and his friend DJ traveled on foot from the Holy Island of Lindisfarne to Durham, where the famed Lindisfarne Gospels were on display. What makes us who we are? What shapes our hopes and dreams, and how do we adjust when things don't go as we hoped? Can we recover if we make a choice that's less than perfect? Voysey tackles these questions and others as he deftly weaves together Cuthbert's story, the history of early Christianity in England, and his own struggle to find his identity and purpose. His introspective writing leads readers to consider their own stories and reflect on how God calls each of us to an identity bigger than any earthly role or career. Part travel memoir, part pilgrim's journal, The Making of Us is a quiet story including a chapter-by-chapter reflection guide of trust in God's leading for our lives, no matter where our paths take us. About "The Making of Us: Who We Can Become When Life Doesn't Go as Planned"
Customer Reviews For "The Making of Us: Who We Can Become When Life Doesn't Go as Planned"
I was so keen to read The Making of Us as I've long been a fan of Sheridan Voysey, having listened to his fabulous radio program Open House for many years and having read several of his previous books. The topic of this book, which is all about how beautiful things can emerge when life doesn't go as planned, resonates with me as I know my life hasn't always gone as planned. Sheridan takes us on a beautifully descriptive journey as he and his friend DJ walk in the footsteps of St Cuthbert on their pilgrimage to Lindisfarne. Along the way DJ  Sheridan have deep conversations and what they share and discuss is very real and raw as they seek wisdom and understanding. I loved so many things that Sheridan said, but one so important reminder is that our one great calling is to love God and love others. When one stream ends, go back up the river and simply love those standing before you. And when we can't become what we want to be, we can still become who we're meant to be. I believe we all can identify with life not going as we planned and there is wisdom to be found in this book for us all. Don't hesitate! Read it now and discover the gems inside! I listened to the audio version of the book as I love Sheridan's familiar voice... I recommend this as a great way to listen to the book! "The making of us" is a beautifully written book in which the author draws 'us' in, inviting us to ponder upon our own journeys, as the author travels his own. Life's purpose is everyone's question at some point in time, but even more poignant for those of us who have faced something which challenges the very core of who we believe we are and what we are on this planet for. This book is a personal account of the authors musings on such topics as he treks through the North Coast of England with his friend. The safety and security this friendship affords the author allows him to explore in conversation some deep and thoughtful personal questions. It is sensitively and descriptively written. Due to the pilgrimage taken in the story, travel and history lovers in particular will enjoy the detail of this book. 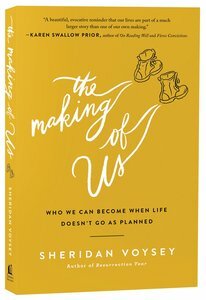 I read 'The Making of Us', after being impacted by Sheridan Voysey's previous book 'The Resurrection Year'. When I read 'The Resurrection Year', I felt as though the author had read my personal journal as background preparation, all the while acknowledging that ultimately, life doesn't go as planned for many of us. The real beauty of his new book is the sense that life is in fact a journey, and despite the sometimes undulating and perilous paths we walk or stumble along, there is a purpose and hope for us. If life hasn't always gone just as you wished or planned (and whose has?) this might just be the book for you. Sheridan and his friend go on a pilgrimage from Lindisfarne Island to Durham Cathedral mostly on foot. The description of their travels is fascinating. However, what I love about the book is how they frankly and honestly discuss how they feel about life's events, memories, where they are now and where they are going. I found their discussions on how God has been involved and how they have handled the ups and down of life very encouraging and challenging. It's a very enjoyable read as well as being thought provoking. I'm sure that any reader will find hope and encouragement in its pages. I received a complimentary copy of this book, but this is my own fair and honest review. Not only was this book food for my soul, but it was nourishing and life-giving. It spoke to me on a deep level whilst also being an easy read (perfect for this busy Mum of 4 living life in Africa). But don't let the phrase 'easy read' put you off.....Sheridan weaves deep truth and important reflections into the journey of his pilgrimage. It is a book you can read and re-read. I read some paragraphs and pages multiple times as I was stopped in my tracks; almost compelled to reflect on what I was reading and knowing this could ( would) change me. I have read other of Sheridan's books and his message is important, even essential, for our culture that measures so much on external values and appearance. This book, for me, was like breathing-in lungfuls of cool fresh air and exhaling deep.Buy this book, make a large mug of your favourite beverage, grab a blanket and begin your own journey as you follow Sheridan on his. Enjoy and breath deep. I was expecting a great book and instead I got a masterpiece of writing, which as all great books do for me, made me a voracious reader. My expectations were met by me being not only able to understand about the author's knowledge of early English church history and how the pieces of the story fit together, but also in the way that I saw into his heart for people. This book has made me fall in love with his natural curiosity for getting to know people. This book has taught me a lot. I've gained more of an understanding about saints and religion in England than I had previously. The reflection guide and creed are also something I am glad to see. They have challenged me to seriously question my thoughts on things like dreams, gifts from God and encouragement, and loss and grief. I love the imagery used to describe the pilgrimage itself, it really made me want to be there as well. Reading the conversations between Sheridan and DJ reminds me of good conversations I've had  before. This book is for people who love reading about Christianity and its history in England,  to people who love castles and other monuments and to those who like reading books that help reflect on new paths and journeys in life. This book isn't just for the target audience, everyone from young to old can learn something from this book.